For September, we had a simple, innovative and great sounding system courtesy of Cameron Keating of distributor MAXMEDIA (refer to http://www.maxmedia.com.au/). 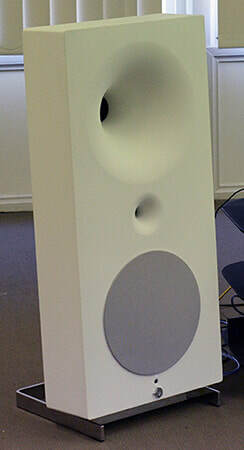 Avantgarde Acoustic Zero 1 speakers. These are radically different speakers. They are digital processors, digital-to-analogue converters, power amps and speakers all in one package. All you need is a source and you have a complete system. Refer to http://www.maxmedia.com.au/www.maxmedia.com.au/High_End_News.html and http://www.avantgarde-acoustic.de/zero1/_en/zero-einfach.html. 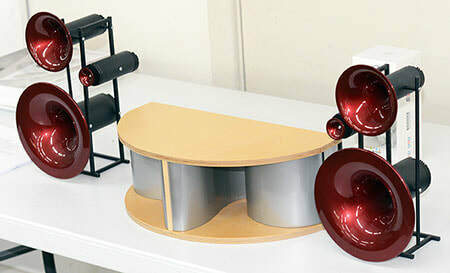 Jonathan Valin reviewed these speakers in the September 2014 issue of The Absolute Sound. He quite loved them, in a long review he raved about their speed, vitality, accuracy, timbre rightness and resolution. And he went so far as to say are likely the very first horn loaded speakers he’s heard that don’t sound like horns. Jonathan’s first impression (Feb 2014) of the Zero 1 can be read online at http://www.theabsolutesound.com/articles/masterpieces-from-avantgarde-and-raidho/. 6 Moons also reviewed them back in December 2013, refer to http://www.6moons.com/audioreviews/avantgarde6/1.html. Abbingdon Music Research (AMR) CD-777 CD player. The CD-777 is a stellar CD spinner and DAC that is quite capable of embarrassing more expensive gear. It has been widely reviewed, all with very positive outcomes. Refer to http://www.maxmedia.com.au/www.maxmedia.com.au/AMR_777_SERIES.html. More detail on the CD-777 can be found at http://www.amr-audio.co.uk/html/cd777_individual.html. Links to reviews of the CD-777 can be found at http://www.amr-audio.co.uk/html/cd-777_reviews.html. We also had an Oppo BDP-95 and monitor on hand for playing content from flash drives. It wasn't required, however, as no one brought any. Cameron obviously knows his products very well, before the meeting we spent at least half an hour listening and adjusting the bass to smooth the response in the room. In the end, the speakers were knocked down a couple of DIP switches. He knew exactly what they should sound like and what they can do. He even got them sounding good in our troublesome room. Cameron’s presentation was much like himself, open, honest, unpretentious and easy going. He spent about 45 minutes explaining the design of the speakers and playing some tracks. The AMR player was used only as a transport. 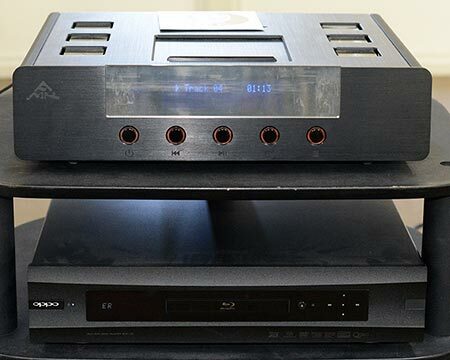 We ran a digital coax into the master Zero 1, and the speakers then did everything including volume control, so really, the speakers would have to be considered the star of the show. People were intrigued and interested as was evidenced by the numerous questions. They so intrigued a non audiophile colleague of mine from work that he came for the day to listen and experience it all. He said it was the best sound he’d ever heard. I thought they were great speakers, especially when you consider their price point. They were detailed, with very good imaging and coherence across the drivers. They had an expansive and realistic soundstage. Some horns can make voices and instruments seem considerably larger than life, the Zero 1’s didn’t. They had exceptional transient speed, sensational dynamic range and wonderful timbre. I was amazed that the cone woofer could keep up with the horned mid-range and tweeter. There must be some DSP magic going on inside to keep things aligned across the frequencies. The system had excellent low level detail and lifelike presence on voice and instruments, without the horn like cupped sound you get from some horns. The bass was detailed and natural though it did sound a little laid back on bass heavy tracks. I wasn’t sure if that was inherent in the speaker design, or if it was the room. They did show a bit of unnatural sibilance at times and did sound a bit forward but I didn’t mind that the images appeared slightly in front of the speakers. It gives them a touch of excitement without actually being bright. It is often the manner in which speakers are voiced these days. Yes, even real Hi Fi has been afflicted with the desire to meet hyped market expectations! Witness the current trend with DACs, unless your DAC supports DSD it is considered to be so 1995. They also had great dynamic range. They could play loud without sounding stressed and their low level detail had an uncanny transparency and openness that allowed voices and instruments to appear believable and “there”. Bill Louey was our presenter in our member’s music segment this month. Bill had selected tracks that represented various regions around the world. Unfortunately, he had to leave Japan out due to a shortage of time! Regarding the music, the Cosi Fan Tutti from Mozart garnered the most number of favourable comments. Most people seemed to have liked the majority of the music. In closing I’d like to say that Cameron drove up from Melbourne just for our club meeting. Not only is he a wonderful presenter, knowledgeable, easy-going and friendly, but most certainly a dedicated and obliging fellow as well. We certainly thank him for spending his Sunday with us.